Morris County has a blanket vegetative waste compost facility plan inclusion policy and a blanket policy for recycling centers. The purpose of the blanket inclusion policies is to encourage and facilitate the development of the above referenced facilities by eliminating the more complicated and time consuming process of including each compost facility and recycling center in the County Plan pursuant to a formal plan amendment process as set forth in N.J.S.A. 13:1E-1 et seq. The blanket inclusion policy is restricted to any new vegetative waste compost facility of less than 5,000 cubic yards of annual capacity. Pursuant to the blanket inclusion policy, any application for a vegetative compost facility of less than 5,000 cubic yards annual capacity for residential leaves and grass clippings, vegetative waste from farms, plant nurseries and greenhouses, produced from the raising of plants which include such crop residue as plant stalks, hulls, leaves and tree waste produced through a wood chipper is consistent with the Morris County Plan and no further plan amendment is required. The revised blanket inclusion policy is restricted to any new recycling center which is a facility designed and operated solely for receiving, storing, processing and transferring source separated, non-putrescible or source separated commingled, non-putrescible metal, glass, paper, plastic containers, and corrugated and other cardboard, or other recyclable materials approved by NJDEP. For such compost facilities or recycling centers to be included within the County Plan pursuant to the blanket inclusion policy, the following procedures must be followed. A full copy of the complete application as submitted to the NJDEPE including all engineering design reports, maps, etc. A statement that written comments on the proposed application will be accepted by the County Division of Solid Waste Management for a period of 30 days from the date of the first notice. The applicant shall submit written documentation that all applicable local approvals and permits have been secured. The applicant shall notify by way of certified, return receipt mail all property owners within 200 feet of the property proposed for use in the vegetative waste compost facility/recycling center. If no substantive objections to the site location are raised by the host municipality, the County Division of Solid Waste Management, the Morris County Solid Waste Advisory Council or any other person, the facility shall be deemed consistent with the Morris County Solid Waste Management Plan. If, however, any such substantive objection is raised, as determined by the County, the proposed site and facility must be subject to formal plan amendment process pursuant to N.J.S.A. 13:1E-23 and 24. The County shall approve the vegetative waste compost facility/recycling center to be included in the County Plan under the blanket inclusion policy by duly adopting a resolution by the Board of Chosen Freeholders and such resolution shall be submitted to the NJDEPE along with a transmittal letter, once the blanket inclusion process has been completed for a particular site(s), and detailed project description set forth in quot;item a" above. Pursuant to N.J.S.A. 13:1E-24d., these modifications are determined to be minor and do not require subsequent County Freeholder action. However, the County may adopt a subsequent plan amendment to include these modifications or make appropriate revisions. For compost facilities processing in excess of 5,000 cubic yards annually, the applicant shall follow the formal solid waste plan amendment procedure pursuant to N.J.S.A. 13:1E-23 and 24 and shall obtain NJDEPE approval prior to construction of the facility pursuant to N.J.S.A. 13:1E-4 and 5. For any facility proposing in-vessel technology, the formal plan amendment process shall be followed pursuant to N.J.S.A. 13:1E-1 et. seq., including notice, public hearing, County Freeholder approval, and subsequent NJDEPE approval prior to construction of the facility. The construction or operation of any solid waste facility noted above shall be preceded by the acquisition of all necessary permits and approvals pursuant to N.J.S.A. 13:1E-1 et. seq., and all other applicable laws. The issuance of operating permits pursuant to the Solid Waste Management Act is limited to those applicants found by the NJDEPE and the Attorney General to be deserving of licensing under provisions of N.J.S.A. 13:1E-126. 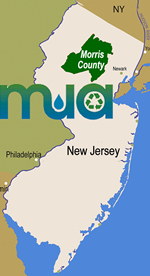 Any residue generated as a result of the operation of the vegetative waste composting facility/recycling center shall be disposed of pursuant to the County Plan and the Interdistrict and Intradistrict Solid Waste Flow Rules (N.J.A.C. 7:26 et. seq. ).